BECKER: You opposed the Vietnam War long before it was fashionable. When and why did you make that decision? Do you feel you made a difference? CHOMSKY: I opposed the Vietnam war from the mid-1940s, when the French invaded, a few years later receiving direct US support. But I did not do much beyond signing statements and the like until 1962, when the back pages of the New York Times casually reported that the US Air Force was flying a large proportion of the bombing missions against South Vietnam, with the planes disguised with SVN markings. At that point I realised that I had better learn more about this, began to look into it more carefully, and had to make a hard decision. I had enough experience with political activism to know that if I became involved, it would soon grow to be a major undertaking, with few limits, and I would have to give up a lot that meant a great deal to me. I decided to plunge in, not without reluctance. It took years of hard and painful work of protest and resistance before a real anti-war movement developed. There is no doubt that it made a difference. One illustration comes from the Pentagon Papers, the final section, dealing with the immediate reaction to the Tet revolt; in imperial terminology, it is called the “Tet offensive”, on the tacit assumption that a revolt against our military occupation is aggression. The government considered sending several hundred thousand more troops to South Vietnam, but decided not to because of concern that they would need the troops for civil disorder control at home in the likely event of a mass uprising of unprecedented proportions. We also know that by then 70 per cent of the US population felt that the war was “fundamentally wrong and immoral”, not “a mistake” – while intellectual elites debated whether Washington’s “bungling efforts to do good” were a “mistake” that was becoming too costly to us (Anthony Lewis of the New York Times, at the outer limits of dissidence within the mainstream). How much any one individual contributed to the radical change of consciousness and understanding, and the willingness to do something about state crimes, it is hard to say. BECKER: You have said the US played a significant role in actions that led to the installation of the Burmese junta back in 1962. What’s the subtext, the background we’re not understanding: What are the consequences of the enormous UK investment in Burma, of earlier US weapons sales, of recent Israeli weapons sales to the junta – and of Chevron Oil’s continued supply of millions and millions of dollars in oil money to the junta? CHOMSKY: Burma had one of the few elected governments in the region in the 1950s, and was intent on pursuing a neutralist course. The Eisenhower administration was carrying out vigorous efforts to enlist the governments in the region into its Cold War crusades. As part of this broad campaign of subversion and violence, Washington installed thousands of heavily armed Chinese Nationalist troops in northern Burma to carry out cross-border operations into China. Burma vigorously objected, but in vain. The China forces began arming and supporting insurgent minorities in that turbulent region. In reaction, power within Burma began to shift to the military, leading finally to the 1962 coup. The matter is discussed by Audrey and George Kahin, Subversion as Foreign Policy. George Kahin was one of the leading Southeast Asian scholars, virtually the founder of the academic discipline in the US. The consequences of the US-UK-Israeli operations you describe are, of course, to strengthen the military junta. These matters are unreported and unknown in the US, apart from specialists and activists, because they interfere too dramatically with the doctrine that “we are good” and “they are evil”, the foundation of virtually every state propaganda system. BECKER: Do you think there’s any chance of a popular uprising being successful in Burma, or do you think those who rise up will only be slaughtered because there’s no advantage for the generals to give up their power? 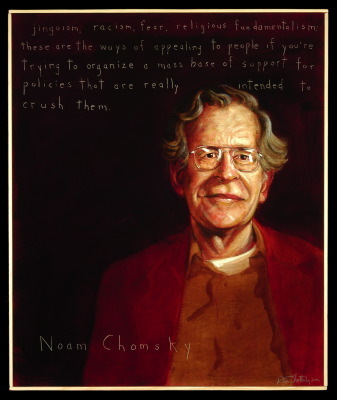 CHOMSKY: I do not know enough to be able to answer with any confidence, but I suspect that now it would be a slaughter. On the other hand, the military leaders are ageing, and there may be popular forces developing that can erode their power from within. BECKER: Was the Kingdom of Thailand morally justified to host US military bases during the Vietnam War? What lasting effects did the Vietnam War have for Thailand and the region? Is that part of why Thailand is an island of relative easy life, compared to neighbours with more severe problems? CHOMSKY: Thailand’s involvement in the US wars in Indochina was a disgrace. I presume Thais, at least some of them, made profit from their participation in the destruction of Indochina. I know that Japan and particularly South Korea gained very substantially. It helped spur their “economic miracles”. To evaluate the lasting effects we have to imagine what Southeast Asia would have been without the sadistic Western (mostly US) interventions of the postwar period – not to speak of what happened before. That’s a topic for a carefully researched book, not a brief discussion – and it would still be highly speculative, by necessity. BECKER: Do you find George W. Bush and his wife Laura calling for change in Burma insincere? Do you think the US president’s action on behalf of the suffering and the marginalised in Burma in the wake of Cyclone Nargis would be more justifiable on moral grounds than the invasions of Iraq and Afghanistan? CHOMSKY: Bush likes to posture as a deeply religious Christian. Perhaps he has even looked at the Gospels. If so, he knows that the famous definition of the hypocrite in the Gospels could have been written with him in mind. One can think of all kinds of ways in which the Bush couple could show their sincerity, were it to exist. If Saddam Hussein had given some money to hungry children it would have been more justifiable on moral grounds than his gassing of Kurds in Halabja. The same principles hold in the case of Negris vs Iraq-Afghanistan. BECKER: What do you think China’s reaction would be if an internal uprising in Burma was successful? CHOMSKY: China would likely tolerate, maybe even welcome, the overthrowing of the junta. There was, of course, a significant US role in actions that elicited the military coup that installed the still-ruling tyranny. But I don’t know how much that bears on the present situation either. BECKER: Can you offer any insight into the behaviour of the Burmese generals, their motivations and how things are likely to work out for the people of Burma? CHOMSKY: The rulers have a good thing going for themselves, nothing to gain by yielding power and no major risks in using it violently. So that’s what they’ll probably do, until the military erodes from within. Mass non-violent protest is predicated on the humanity of the oppressor. Quite often it doesn’t work. Sometimes it does, in unexpected ways. But judgements about that would have to be based on intimate knowledge of the society and its various strands. BECKER: If a regime is so terrible that its generals loot the wealth of the country’s resources for their personal gain, carry out murders, political imprisonment and forced labour, is there a moral justification for an armed uprising of the suffering people? CHOMSKY: There certainly is, in my view, with one qualification: An armed uprising would have to evaluate with care the likely consequences for the people who are suffering. I think it’s appropriate for people to rise up, but it’s not for me to tell people to risk mass murder. As for assassinating leaders, the question is very much like asking whether it is appropriate to kill murderers. They should be apprehended by non-violent means, if possible. If they pull a gun and start shooting, it’s legitimate to kill them in self-defence, if there is no lesser option. BECKER: Would you give any examples of what could happen if the principle of universality were applied in the world today, between nations that are in conflict? CHOMSKY: One example is that Bush, Cheney, Blair, and a host of others would be facing Nuremberg-style tribunals. And the observation generalises very broadly. BECKER: What are the greatest dangers facing our human species in the world today and what can we most effectively do about them? CHOMSKY: There are two dangers that could reach as far as survival of the species: Nuclear war and environmental disaster. About nuclear war, we know exactly what to do. In fact, the World Court has ruled that it is a legal obligation of the signers of the non-proliferation treaty to live up to their obligation to eliminate all nuclear weapons. And the non-signers can be brought in as well. To give an example that is highly relevant right now, the US population is overwhelmingly in favour of establishing a nuclear-weapons-free zone (NWFZ) in the Middle East, including Iran and Israel. The US and the UK are formally committed to this policy. When they tried to construct a thin legal cover for their invasion of Iraq, they appealed to Security Council resolution 687, which calls upon Iraq to eliminate weapons of mass destruction. The US-UK invaders claimed that it had not done so. Resolution 687 also commits the signers to establish an NWFZ in the region. If the US were a functioning democracy, in which public opinion influenced policy, the exceedingly hazardous confrontation between the US and Iran could be mitigated, perhaps terminated. Naturally, none of this can be reported or discussed, and it is inconceivable that any viable political candidate would even hint at the stand of the overwhelming majority of the population. One may recall a remark of Gandhi’s when he was asked what he thought of Western civilisation. His response was that it might be a good idea. The same is true of “democracy promotion”, which, if sincere, would begin at home. How to stave off the threat of severe environmental catastrophe is less clear, though some measures are obvious: Conservation, research and development of renewable energy, measures to cut back emissions sharply, and others. What is eminently clear is that the longer we delay in addressing these problems, the more grave will be the consequences for future generations.